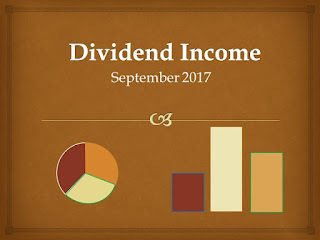 My Total dividends in September are € 830.72 ($ 991.60). After tax payments, my net dividend income is € 616.19 ($ 735.49). In year 2016, my net dividend income in September was € 481.83. My portfolio's net dividend income increased by 28% to compared the same month of last year. This month's dividend increased my cumulative net dividend income € 46,477.40. My net dividend income YTD is € 8,844.44, so I have now collected 79% of my target net dividend income for this year, which is €11,200.00. At this time, it seems that I will stay a little below my target. The end of the year's performance depends a lot on how the Euro's exchange rate evolves to the dollar. Full Disclosure: Long on above mentioned stocks. Keep up the good work :) At the moment I am only investing in Johnson & Johnson of the above mentioned stocks. Very good Hawk! Sep was huge for me as well. Keep it up! Pretty much $1K in dividends this month is fricken awesome. Further, you have only a couple big guns with three digit incomes coming in but are evenly spread. Impressive. Congrats on the growth rate Hawk! Impressive growth. Very well done! Good job Hawk! I see that we hold quite a few of the same positions..... yours are just bigger ��. For real though great month. I hope that your portfolio continues to prosper. Killing it with that income, Hawk. Keep up the great work! Congrats on the great month. Almost broke that 1k mark. Maybe you will hit that by time the year is over. Great job!